Macedonian Kingdom. Antigonus Gonatas. 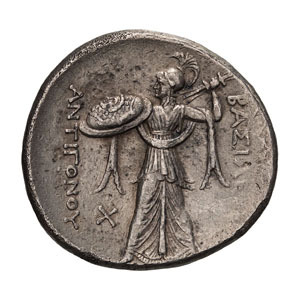 277-239 BC. 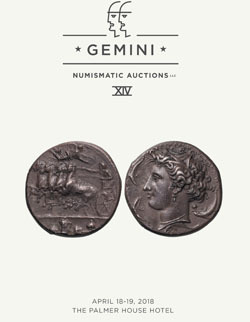 Tetradrachm, 17.06gg. (12h). , Chalcis in Euboea, after 263 BC. Obv: Macedonian shield with head of Pan and club in center. Rx: ΒΑΣΙΛΕΩ[Σ] / ΑΝΤΙΓΟΝΟΥ Athena Alkis attackng left with thunderbolt and shield, X in lower left field. Imhoof-Blumer pl. D, 13v (same obv. die). Cf. Merker p. 46 var. (with additional monogram). Extremely rare issue. Toned EF. A very rare variety with X in the left reverse field rather than the usual Macedonian helmet. I.L. Merker discusses this variety in some detail on p. 46 of “The Silver Coinage of Antigonos Gonatas and Antigonos Doson” in MN 9 (1960). Merker knows only two dies marked by reverse X and suggests that such coins were struck in Chalcis in Euboea rather than Amphipolis or Pella, the source of the great majority of these tetradrachms. Merker's article unfortunately lacks plates, so the present coin cannot be directly compared to his two X dies. Our coin is however apparently unpublished, as both of Merker's dies also have a monogram in the right field of the reverse, a detail lacking on the present coin. 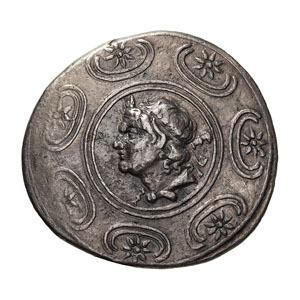 Merker also notes the distinctive goatskin tied around Pan's neck (rather than the simple band found on the vast majority of specimens), though he overlooks another anomalous detail of our coin, namely the simple club behind Pan's head, in place of the usual curved lagobolon.